When you've run your computer for a few years, you might notice that there're too many files in your hard drive, something important, something not. And, there're many duplicate files there, for example, duplicate photos/images/pictures, duplicate MP3 songs, duplicate videos, and so on. The duplicate files are locate at different folder. This situation might confuse you and, the duplicate files take much hard driver free space. I introduce you an easy way to find and delete the duplicate files with a free duplicate file finder remover. It's SearchMyFiles. The SearchMyFiles is a 100% clean FREEWARE. You will see there're many search options for duplicate files on screen shot above. You could set one or more search folders by clicking "Browse" button. And, the SearchMyFiles freeware enables you to set excluded folders. And, you can set files wildcard. To find any type of duplicate files, you could set "*. *" at files wildcard. To find duplicate photos/pictures/images, please set "*.jpg;*.jpeg;*.bmp;*.png;*.gif;*.tiff" at file wildcard. To find duplicate music files, please set "*.mp3;*.wma;*.aac;*.m4a;*.m4b;*.ogg;*.wav;*.flac;*.ape" at file wildcard. To find duplicate video files, you may set "*.mp4;*.avi;*.3gp;*.flv;*.mkv;*.mov;*.mpg;*.ogv;*.ts;*.vob;*.webm;*.wmv" at file wildcard. To find duplicate PDF files, you can set "*.pdf" at file wildcard. To find duplicate Microsoft Word/Excel/PowerPoint files, you can set "*.doc;*.docx;*.xls;*.xlsx;*.ppt;*.pps;*.pptx;*.ppsx" at file wildcard. To find duplicate web pages, just set "*.htm;*.html;*.php;*.asp;*.jsp" at file wildcard. 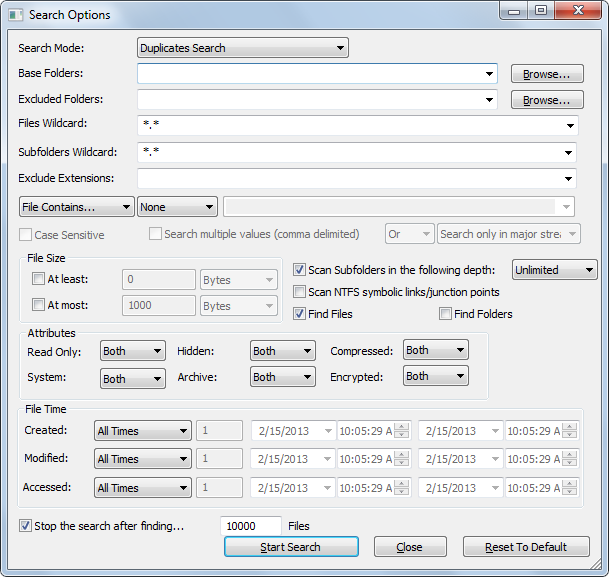 You can limit file size range for duplicate files search with the freeware. The SearchMyFiles freeware allows you set file attributes such as Read Only, Hidden, Compressed, System, Archive, and Encrypted. You could set file create time, modified time, or accessed time in the freeware. Once you click "Start Search", the duplicated file will be showed in man window of the freeware. SearchMyFiles marks the duplicate files with identical colors. 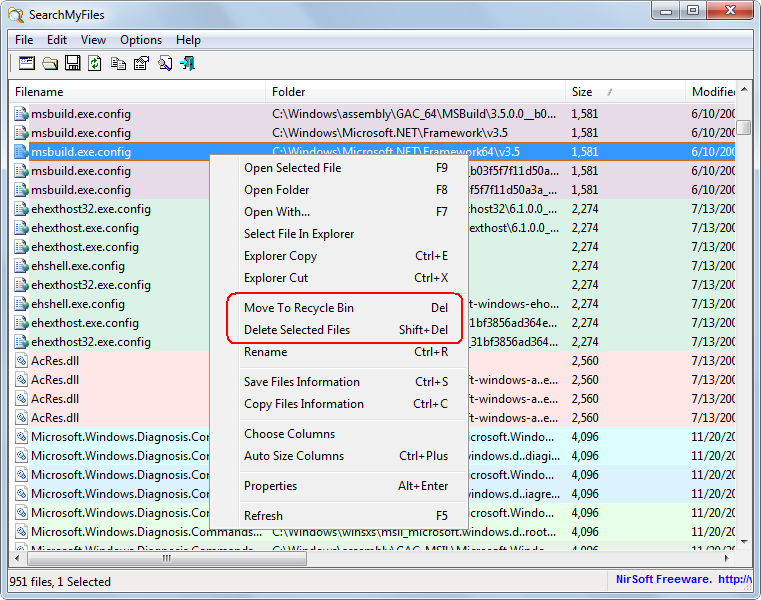 To delete the duplicated files, please just right-click on the file item and choose "Move to Recycle Bin" or "Delete Selected Files." Note: the duplicate file search is done by making a binary comparison of the files with the same size, byte by byte. This make sure the duplicate files are absolutely identical. You can also associate the SearchMyFiles freeware with Windows Explorer, so that you could launch the freeware by right-click on Windows Explorer. To enable the feature, please click "Options -> "Explorer Context Menu." 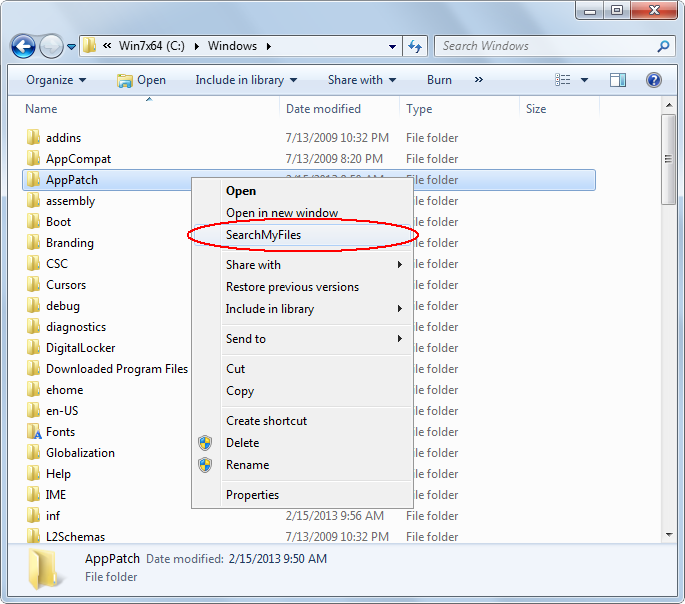 SearchMyFiles freeware works with Windows 2000, Windows XP, Windows Vista, Windows 2003 Server, Windows 2008 Server, Windows 7, and Windows 8, both 32-bit and 64-bit editions compatible. This is a portable freeware (no installation necessary), just unzip the downloaded file, and then double-click on file SearchMyFiles.exe.